There is currently an email being circulated that is asking the community to stop supporting Jewish Federation & Family Services of Orange County and OC Hillel. This is regarding the Olive Tree Initiative’s decision to host a Palestinian speaker, Mr. George S. Rishmawi, at UC Irvine on November 22., 2010 Let us be clear that the Jewish Federation and Hillel is, in no way, sponsoring or funding Mr. Rishmawi’s visit to UCI. The Jewish students of the UCI community feel this email, written by Dee Sterling, is not in the best interest of the students on this campus. Her call to remove funding sources from the only Jewish and pro-Israel groups on campus is unfair, unjust, and unwise. Anteaters for Israel: The biggest pro-Israel group at UC Irvine, which is funded in part by OC Hillel and the Rose Project of the Jewish Federation. Hillel at UC Irvine: The community of Jewish students at UC Irvine, which has weekly Shabbats and Open Houses that foster a sense of Jewish community at UC Irvine, with hundreds of students in attendance. MPME at UC Irvine: A pragmatic and anti-BDS organization, that works to show Arab and Islamic injustice in the world and supports Israel through political means. American-Israel Alliance: A coalition of AIPAC-trained pro-Israel advocating students that approach student leadership to support pro-Israel agendas on and off campus, and pro-actively prevent BDS movements on campus through personal relationships. Furthermore, Olive Tree Initiative is a diverse group of students, many of whom are proudly pro-Israel and anti-BDS, and who comes from a variety of backgrounds and connections to Judaism and the Middle East. We respect their choice of the to attend possibly controversial events with speakers from both sides of the conflict in an effort to raise discussion, awareness, and education on the campus. Such statements as the one made by Dee Sterling are entirely inappropriate, intolerable, hurtful and create a divide amongst the Jewish students and student groups, community, faculty, parents, and friends. At this critical time, we all must band together to fight anti-Israel propaganda and anti-Semitism; rather than send emails out to community without context, without connections to campus, and without the approval of any undergraduate student or organization at UC Irvine. This is completely and entirely unacceptable and the student community will not tolerate it. There was absolutely no attempt to contact any Jewish student leader or any of the Jewish student organizations at UC Irvine before making this statement, which affects all of us—all of the Jewish students—with such magnitude. We, the students—the Jewish students at UC Irvine—as well as the community and faculty who support us, are open for discussion on any topic at any time, and strongly condemn this email from Dee Sterling. 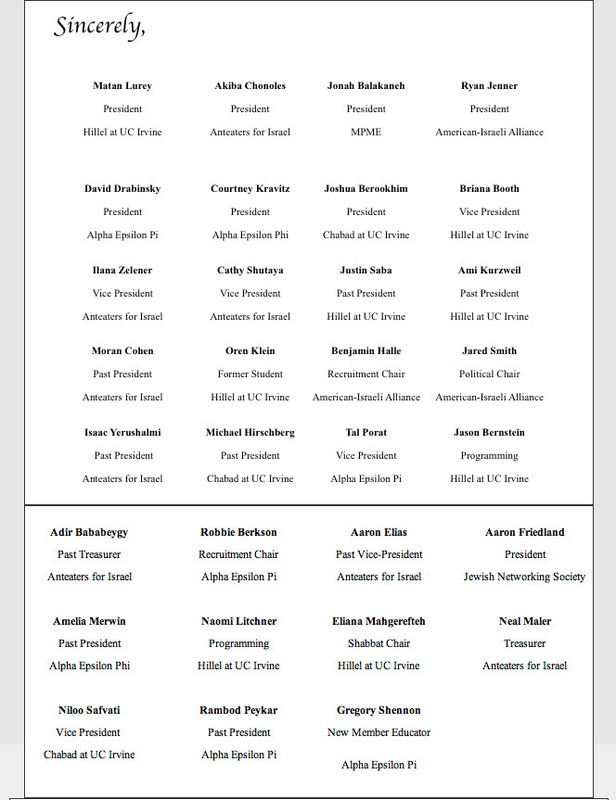 The following students which are the most involved with Jewish life on campus are against Dee Sterling’s call to boycott UC Irvine Jewish Life, and to sanction the community organizations that are helping us the most. Any divestment from the Jewish Federation of Orange County, Hillel of Orange County – arguably the only two active communities that directly aid and work with the students—would be a travesty. 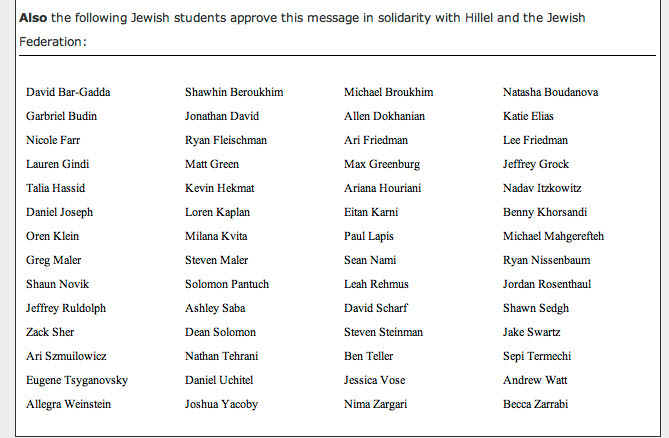 The Signatures in the Petition referred to in the letter below were Falsified by Hillel. Despite admitting that the Majority of the Student had not consented to being included and had not seen the Letter they were protesting, Hillel now claim a "clerical error" but has refused to Issue a Retraction or send a Letter of Apology to the Friends of Hillel. Surely we should be able to expect more of our Leaders?